As I knew the final verdict was due today I didn’t get weighed on Monday. So 11 days after my last weigh-in I was more than a little nervous this morning but I went live on Facebook anyway. If you’ve read the About me page of this blog you’ll already know that I was born just 10 weeks after my Dad and Sister were killed in a car crash and that my amazing Mam is the inspiration for everything I do. But what I haven’t talked about before is the reason I was given my name. As I’m sure you can imagine it was a pretty tough time for my Mam. She had lost not only her husband of 18 years but also her first born child in a horrific and tragic accident. But she couldn’t grieve too openly because she had two other teenage children, who were obviously devastated, to look after. So my birth was not the traditional time of joy and celebration but was tinged with a great deal of sadness. While my Mam clearly adored me when I was born thinking of a name had not been her top priority in the weeks running up to my birth. Back in those days new mothers spent about a week in hospital after giving birth. Supposedly to recover from the ordeal, relax and enjoy spending time with their new baby. But for my Mam it was a time of worry. Worry that her other children were being looked after, worry about how she would cope both financially and emotionally and of course worry about what the future held. So when it came to her leaving hospital a week or more after I was born she still didn’t have a clue what she was going to call me. Now all the nurses knew her story and I’m sure many felt as I do that this was one incredibly brave and strong woman. So it was probably with a little trepidation that one of those nurses approached her about my name. I’m told the conversation went like this. Nurse: Have you chosen a name yet? It would be lovely if we knew what it was before you go home. Mam: I don’t know. I’ve not really had the chance to think about it. Nurse: She is beautiful. A really good baby. She’s such a little angel. Why don’t you call her Angela. Mam: (after about 5 seconds thought) Yes, that’s perfect. My little angel. And that was it. My Mam used to tell me I was an angel sent down from heaven to bring her joy in a time of sadness and to help then all get through the day. And that’s why she hated it when anyone shortened my name because to her Angela and angel were synonymous. Now I don’t know about being an angel – goodness only knows I put her through some tough times – but she always said I was her angel and it’s always stuck with me. So when it was time to decide on a tattoo I didn’t really have a clue. I thought about having an angel but it seemed a bit pretentious or self-centred. Then my amazing daughter-in-law, Gemma, suggested a dove. Not just any dove but a dove with an olive branch. I don’t know if she knew what it meant but for me, as a Christian – albeit not practising – it was the sign of the Holy Spirit or in other words an angel here on earth. Then just a few days later I heard the old Madness song “Wings of a Dove”, the first time I had heard it in years. And it just seemed right. And of course the charity I’m supporting, the Charlie Cookson Foundation, only exists because one very special little boy got his Angel Wings far to early. So there was not choice. My tattoo will be a little blue dove, carrying an olive branch just as it did when Noah set it free after the floods and when Jesus was baptised . When I said I wanted to lose two stone in a year I was fairly certain I could do it. Then when I didn’t start for almost half that year I wasn’t so convinced. In theory I have lost over two stone. If you add up all the pounds I’ve lost it comes to more than 28 which is two stone. But of course that’s only because I’ve had weeks where I’ve put weight on. 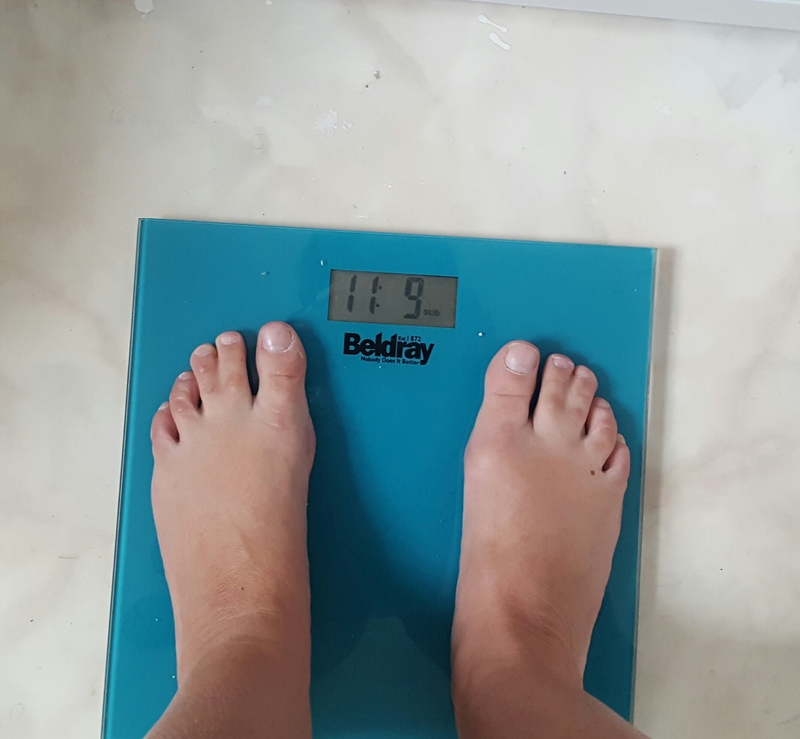 And of course losing the same pound can’t count twice, except when it comes to donating £1 to the Charlie Cookson Foundation because they do get £1 every time I lose a pound. But when it comes to calculating my total weight loss I can’t claim to have lost two stone just yet. Last week I still had 5 pound to go. And yet again I gave in to temptation this week and had a takeaway – this time a curry – and although it was delicious I know it can’t have helped the weight loss. Another pound off. Less than I would have liked and certainly not enough for me to rest on my laurels. So between now and my birthday I will be good. In fact not only good but extra good. I’m not going to starve myself because that won’t help shift those last four pounds but I am going to eat healthy and try to get a little bit of exercise. Oh and my other strategy for the last 11 days is to cross my fingers, say my prayers and hope the scales are kind. Because this is one challenge I really don’t want to fail. Those last few pounds really are proving to be the hardest. So I need all the help and encouragement I can get. If you spot me about to eat something I shouldn’t please stop me.